Its been quite sometime I got to write on kitechkatta..Firstly wish you all a very Happy New Year 2016!! 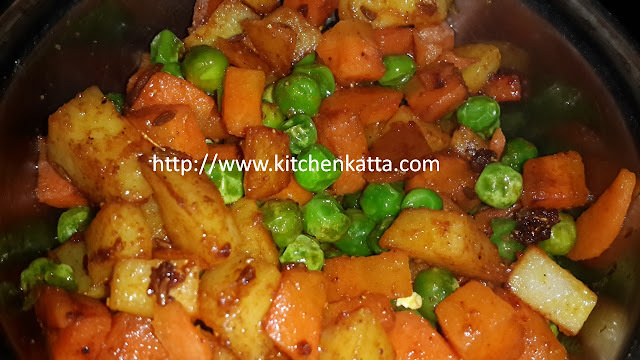 Long vacation kept me away for sometime and also kept super busy..but how can I forget kitchenkatta!! It kept on my mind all the time. So finally I decided to write it today.. So here is a quick yet tasty sujbi to accompany hot phulkas or daa-rice. 4. Add turmeric powder, red chilli powder, garam masala, sugar and salt. Mix well and cook another few mins till the oil starts separating. Enjoy hot with chapati, pulka or daal-rice.